One of the oldest and most decorated NHL franchises in history, the Detroit Red Wings are part of the famed "Original Six" teams. With 11 Stanley Cup titles, their success has resulted in a fan base that ranks among the largest in the NHL. 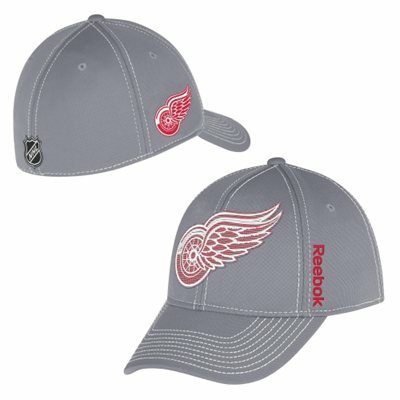 With that in mind, the following guide features gift ideas for fans and collectors of the Detroit Red Wings. This guide mostly focuses on gift buying, so if you are looking for more detailed team information, check out comprehensive Detroit Red Wings Collecting Guide. 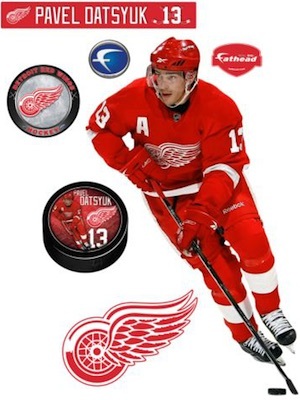 The list below featured 20 different gift ideas that are sure to make a great gift for a fan or collector of the Red Wings. A variety of price points are covered so that shoppers of all budgets can find several items in their range. Widely viewed as one of the greatest players in NHL history, Gordie Howe is the top option for fans and collectors of the Red Wings. 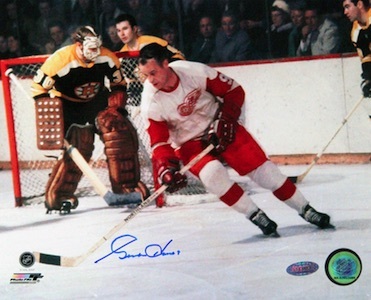 Signed gear from "Mr. Hockey" is expensive, but an autographed photo is a more budget friendly option and sure to be a cornerstone piece for most collectors. 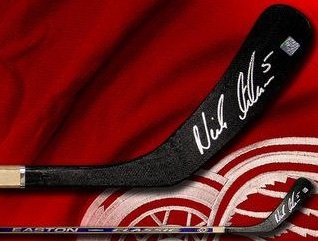 Nicklas Lidstrom spent his entire 20-year career with the Red Wings and retired in 2012. 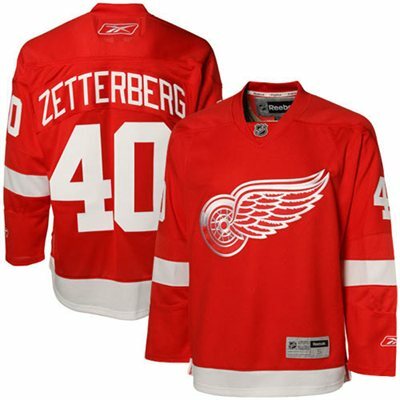 He is one of the most decorated European players in NHL history and a fan favorite in Detroit. An autographed hockey sticks presents an appealing gift option that would look great on display in a man cave. Another all-time great in the history of the Red Wings, Steve Yzerman totaled 22 seasons with Detroit and is one of many Hall of Fame players for the franchise. His signed photos are expensive but Yzerman ranks near the top for fans and collectors of the team. The son of the NHL-great, Bobby Hull, Brett Hull was a star in his own right and remains popular with the Red Wings despite only spending three seasons with the team. Signed gear for Hull is quite plentiful and deals can be found. 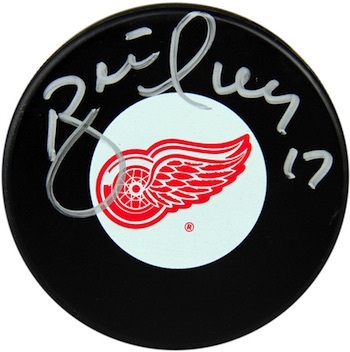 A signed puck makes a great gift, especially if space is an issue. View more signed options here. A current star on the Red Wings, the Russian-born Pavel Datsyuk won two titles with the team and most hope he can add another before he retires. His signed photo offers an ideal option for a current fan of the team. 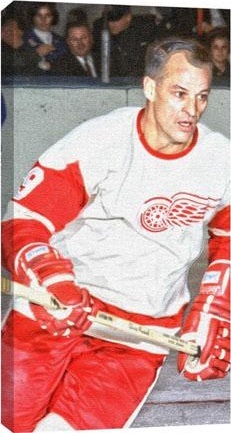 While he logged time with several teams in his Hall of Fame career, the bulk of it was spent with the Detroit Red Wings. Shanahan won three Stanley Cups with Detroit and is an all-time great for the franchise. 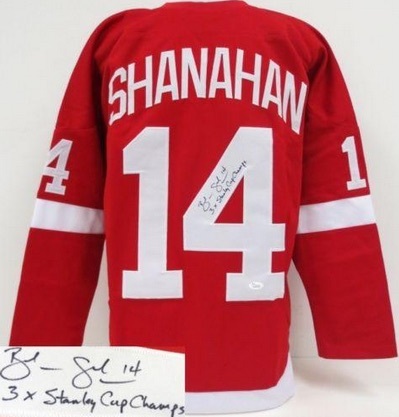 A signed jersey for Shanahan is a nice premium gift option and great for display. Chris Chelios played for some of the biggest NHL franchises, including Chicago and Montreal. But his time with Detroit in the latter half of his career made him a fan favorite and was an amazing testament to his longevity during his Hall of Fame career. Despite this, signed photos for Chelios can be found for budget prices and make an awesome gift. Featuring a classic look, this canvas print honors Gordie Howe with a colorful image and would make a great gift option that would work in nearly any setting. While it would look good displayed as is, a signature would take this gift to the next level. 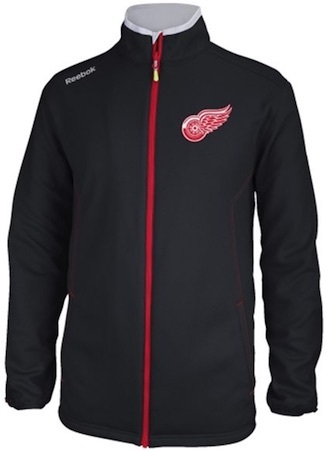 Not all great gifts for the Detroit Red Wings need to be signed pieces. This framed collage showcases another current star in Henrik Zetterberg and includes a piece of a game-used puck. View more plaques and collages for the Red Wings here. 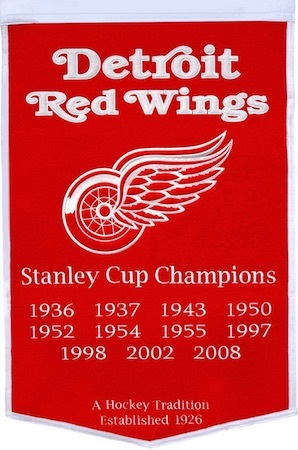 With 11 titles already, fans and collectors of the Red Wings have plenty to celebrate. This wool banner is a great way for someone to showcase their affinity for the team and a nice gift option. 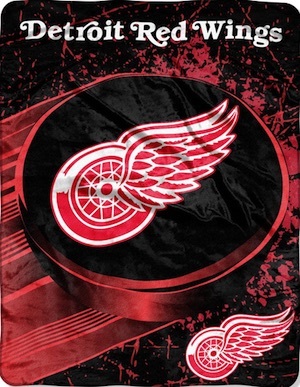 More of a budget gift or stocking stuffer, this blanket for the Red Wings features a vivid design and provides much needed warmth for the long hockey season. 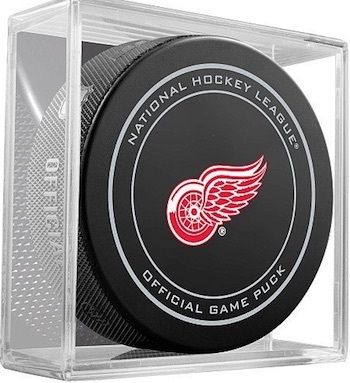 Another budget gift for the Red Wings, this puck can either be displayed or actively used. The puck can be combined with the blanket to make a fun combo gift. Hockey cards are a popular option for fans, but they are not as simple to buy because they are so specific. 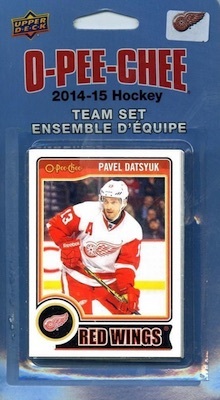 One option we recommend for budget gifts or stocking stuffers is Detroit Red Wings team sets. Some are sealed and some are hand-collated, but the result is the same. Make sure to verify the year of the card and the players included to make sure you are getting what you expect. 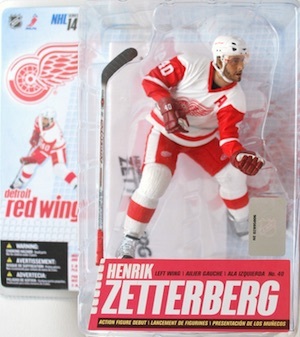 Whether shopping for a child or an adult, Detroit Red Wings figures and bobbleheads can be a great gift. Several different brands offer a variety of options and many players can be found from the history of the franchise. Check out specific figures on eBay using the links below. There are a good variety of different Detroit Red Wings team fatheads. In addition to team logo versions, players are some of the top Fatheads and three of the most popular Red Wings are noted below. 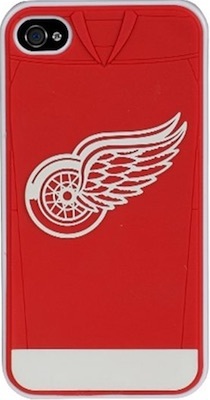 Smartphones are the new norm and can make for an easy and inexpensive gift for a Detroit Red Wings fan. Just make sure to verify the exact make and model before you buy. We have included direct links to Amazon below for the most popular phone models. 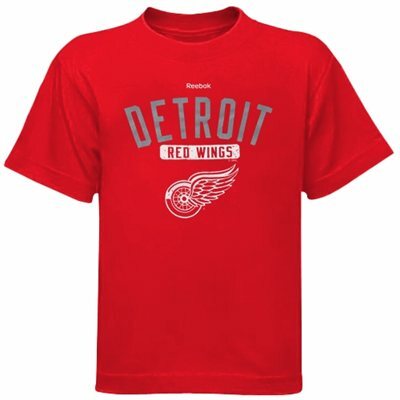 Jerseys remain the most common way for fans to display their love of the Detroit Red Wings. Replica versions offer cheaper prices and fans can also have them customized for added appeal. If you are overwhelmed by the many versions, check our detailed NHL jersey guide here. DETROIT RED WINGS TOMAS TATAR JERSEY XL !! !